I am someone who uses makeup several times a week and someone who likes to try new ways of doing makeup. Like fan Kat Von D I wondered what products I can find on in stores that haven't been tested and have been tested on animals. 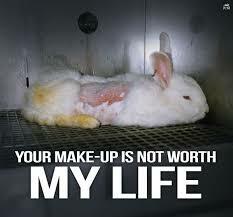 I was exploring and I was sincerely disappointed with some of the products I used,that are tested on animals. As I searched their website, I was wondering how many animals were killed by testing some products and whether it was worth it (and I tried to look for a percentage, but I am not unable to find that). In the second part of the post i will tell you which famous brands test their products on animals, which are cruelty-free.